Lost in the thrill of rookie David Bote’s spectacular walk-off grand slam was the best pitching duel of perhaps the entire season. New Cubs acquisition Cole Hamels threw seven innings of one-hit, one-run ball, and Max Scherzer, favorite for a third straight Cy Young, did him one better with three hits and 11 strikeouts over seven shutout innings. 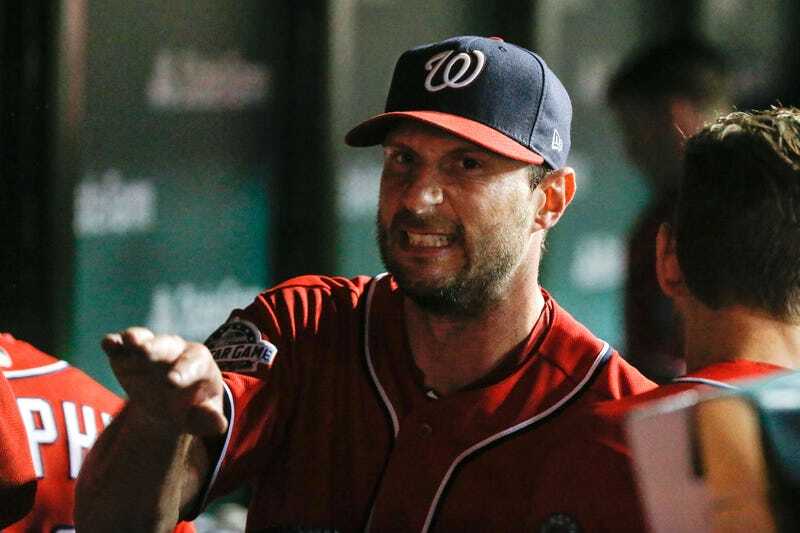 Scherzer, as you know, is an absolute madman. When he’s not snarling at his own coaches or growling at batters, he’s swearing up a storm at the baseball. I would not want to face him, and I would want to face him even less when he’s screaming as he lets fly a 97 MPH high fastball. Despite a chippy players-only meeting and a deadline purge of supposed bad actors, the Nationals are still scuffling outside the playoff picture, and Sunday’s loss was easily the year’s most brutal. It’s a hell of a microcosm of the entire season, as Scherzer’s best statistical year yet looks like it’s going to be wasted. “It’s a gut punch,” said Scherzer, his voice lower than usual, as if he had yelled it out or simply couldn’t find the energy to lift it.